Scouting Report: Is Memphis Depay Another Andros Townsend? An excellent question, and one that should concern clubs looking at spending between £15 to £20M on PSV’s left wide forward. Today I’ll tuck into both of their stats to find out. So much try, so little do. Elite dribbling and shot generation, good passing accuracy, plus decent key pass numbers. Useless when it comes to end product. Now Memphis Depay, last season. Huge key pass, shots, and dribbling numbers. For a wide forward, this is what is known as the trifecta. He also has good goalscoring and assist numbers, and his passing percentage is still good for a high-usage attacker. Obviously it’s only two games, but if anything, Depay has stepped it up a notch this season. He’s currently averaging 6.68 shots, 2.57 key passes, 3 completed dribbles per90 and his scoring contribution (non-penalty goals + assists) is a stratospheric 2.06. He’ll cool off – 3 non-pen goals and an assist in 2 games is like surface-of-the-sun hot – but that type of start suggests improvement on last season where he was already good. So where Townsend shows spikes in shooting and reasonable key pass output crossed with almost zero end product (goals and assists), Depay delivers. Last season, his scoring contribution was .6 goals and assists per 90, and he was 19 most of the season. It should also be noted that PSV was really quite average last year. If they played in the same league, or even in similar leagues (EPL is fairly similar to La Liga and Bundesliga, though in Bundes you need to lower everyone’s dribbling stats), then this would be easy. Since Eredivisie is a considerably weaker league than EPL, some of you will read this article, shrug, and go right back to what you thought before. That’s cool. 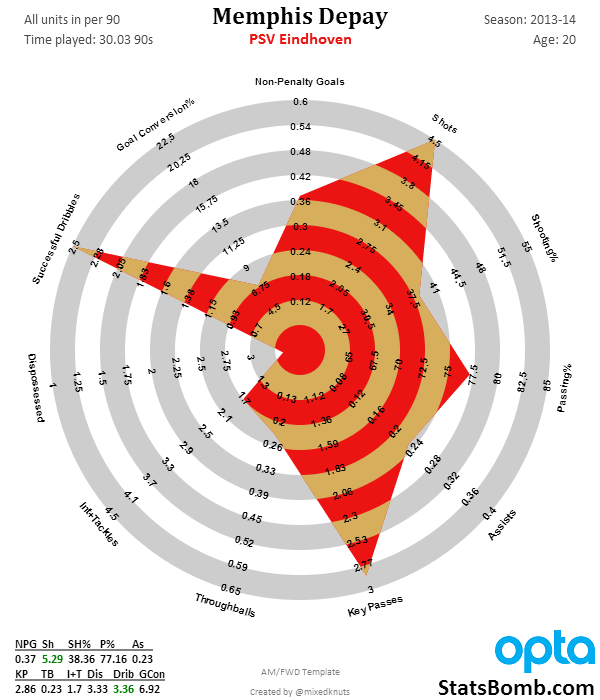 I just want to note that while there have been plenty of notable busts from Eredivisie, there have also been plenty of players like Suarez, Strootman, Mertens, Eriksen, and recent Southampton addition Dusan Tadic that are super talented. Let me explan a little more on why I think Depay is a rare talent. Their names? Ronaldo and Messi. Sure whatever… it’s one season. Okay, expand the sample then. How many guys have created more chances per 90 in a single season over the last five years? Their names? Ronaldo (5 times), Messi (1), Suarez (1), Wesley Sneijder (1), and RVP (1). Now granted, Depay had the lowest goalscoring and combined scoring rate of any of those players in his season and he played in a weaker league, but he did it at 19! All those other guys were in their mid-20s. Marco Reus in 13-14 was right behind Depay in chance creation numbers, and he did it at 24. Not all players age the same, but 19 is absurdly young to be putting up numbers like that in a real league. What if Depay keeps developing? I’ve looked at quite a bit of data on young scorers and how they develop – I’d say it’s better than 50% odds that he will sell for £45M at some point later in his career. Can teams afford not to buy him now? 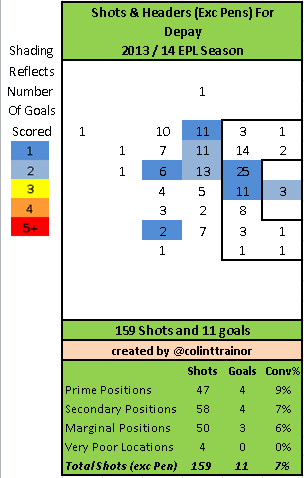 One common complaint you will hear is that Depay is wasteful with his shooting, and like Andros Townsend, he often shoots from poor locations. With some help from @colintrainor, we can examine that too. 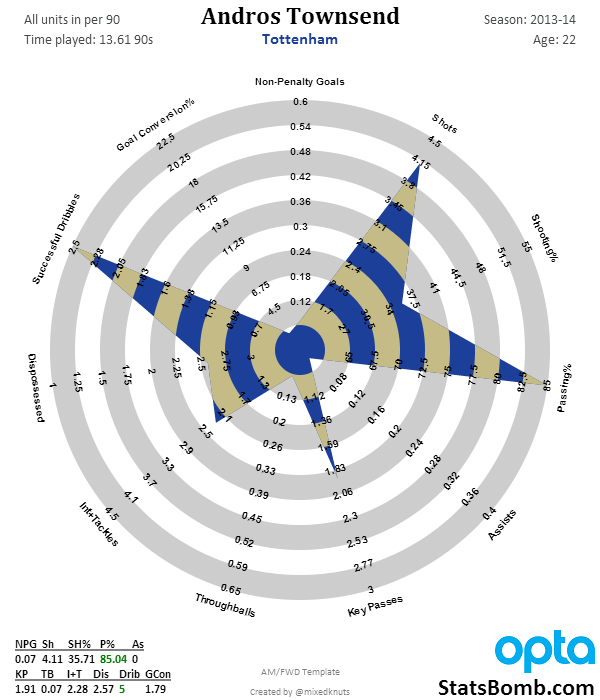 And here are Depay’s shots from last season. 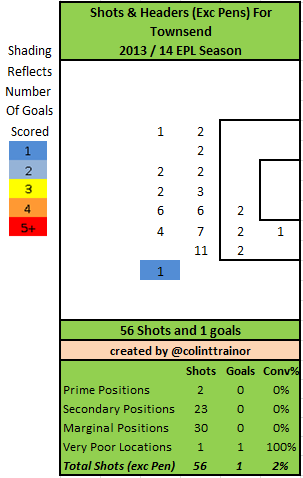 159 shots, two-thirds from either prime or secondary positions. That’s not bad. Only a fractional amount from very poor positions is also positive. You would hope that with his great athleticism, he could push a little more forward in the coming years and get to 80% or so from prime or secondary, but this still isn’t that bad. Compare it to Townsend’s shot chart and it looks amazing. Andros Townsend? Still a question mark. As it is, he had a fluke goal and no assists in 13.6 90’s, which is abysmal. There’s talent there, but can it be harnessed? If you can move everything he does toward the goal by 6-7 yards, he’d be amazing – can that be coached? We’ll find out. Which EPL teams could use Depay? Which teams need elite left-sided attackers? Spurs for sure. Arsenal also need one, though they also need more depth and athleticism at DM to allow them to play a wider 4-3-3. Liverpool? Probably not, as they already bought Markovic and have Sterling and Coutinho who can both play there at a high level. Southampton certainly do, but at this point I am guessing he’s aiming higher than that. Everton could also use an upgrade out there, but after buying Lukaku this summer, we are out of their price range. Why hasn’t Depay moved yet?